C++ is a sophisticated, efficient and a general-purpose programming language based on C. It was developed by Bjarne Stroustrup in 1979. Since it is an enhanced/extended version of C programming language, C and C++ are often denoted together as C/C++. C++ is a middle level language, you will write code that interacts directly with the internal hardware of the computer. Why KaaShiv InfoTech Company to learn C++ Training in Chennai? Kaashiv provides Best C++ Training in Chennai with professional trainers who provide real-time training and also projects to the candidates for better understanding. 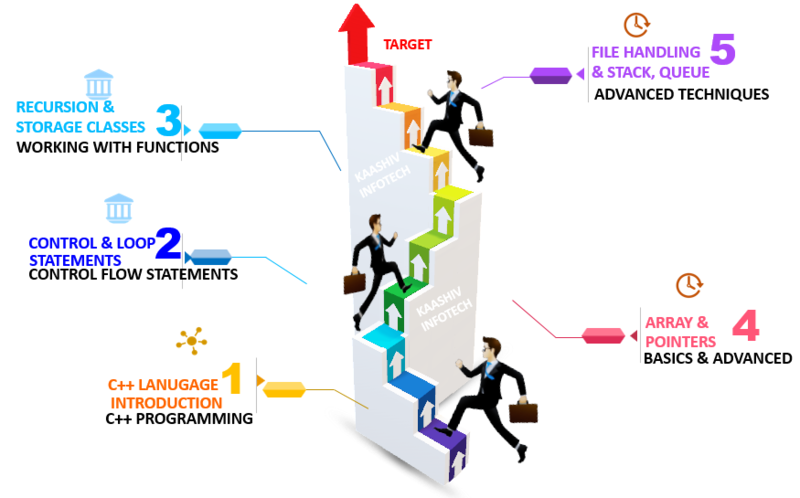 Why Students Enroll for real time C++ Training in Chennai ? With the use of C++ in development of modern games, operating systems, browsers, and much more, it is safe to say that C++ is irreplaceable. C++ has greatly influenced by other object oriented languages like Java, C# .net etc. C++ is suitable for the cloud environment to build an OS with a cloud or distributed environment. Students undergone C training will be expertise in C++ Programming and automation testing + real time Software Implementation. For C++ Training 120 concepts from Basic to Advanced will be covered.